I saw so many different types of happy people tonight walking home… Rich couples, young couples, old couples, gangsta couples, parents with their kids and groups of friends. We all live such different lives but at the end of the day, we just want to be surrounded by the ones we love. The man I love, happens to love red velvet cake so that is what I delivered! 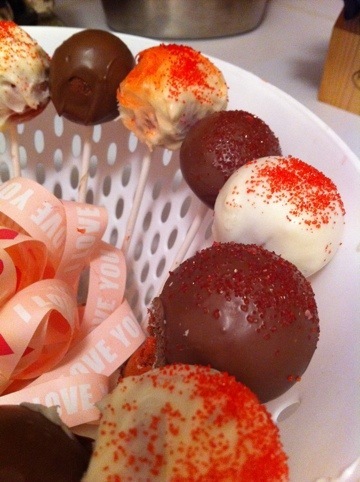 I used my new cake pop machine and have up say they turned out much better than the time I tried to just hand roll them. I guess all that really matters is taste! Well, here they are! 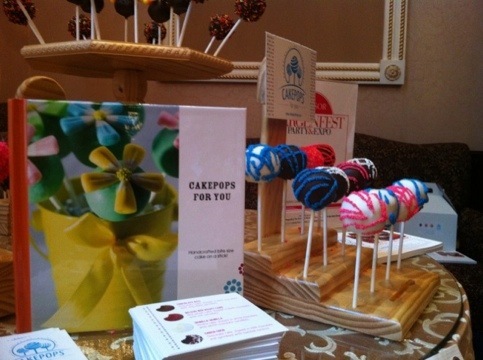 CAKEPOPS for You greeted us at the door to Bergenfest Party & Expo 2011 last Thursday afternoon and what a pleasant greeting it was! I have tried to make this latest dessert trend at home and I can promise you my version of cake pops looked nothing like theirs! Not only was their display amazing, but the taste was as equally satisfying. I mentioned before that I tried the carrot cake-cake pop covered in white chocolate and orange sprinkles and would highly recommend it! I am not a fan of white chocolate and I have to admit I didn’t even realize that is what I was eating until I had already finished half. I guess I do like white chocolate after all! Ok so maybe I tried another one…They were also handing out a chocolate cake covered in chocolate with colored sprinkles cake pop. I honestly can’t wait to go to their store in Ridgewood and see what other flavors they have! I just need to wait for a special occasion because I know I will single handedly eat whatever I bring home. I’m sure I will be able to come up with some excuse very soon. Maybe to celebrate Thursday, tomorrow! What I like most about this treat is that they are the perfect size to just grab one and try a certain flavor, and ENJOY that flavor, without eating an entire piece of cake or cupcake. They occasionally have offers on groupon as well so be sure to check that out! 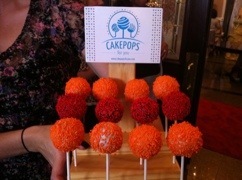 Latest dessert trend- cake pops!